La Gloria Cubana Rabito de Cochino…love at first light! Rabito de Cochino: a fine example of the virtues of the lonesdale. In my recent review of the La Palina Maduro Lancero, I extol the virtues of thin cigars. 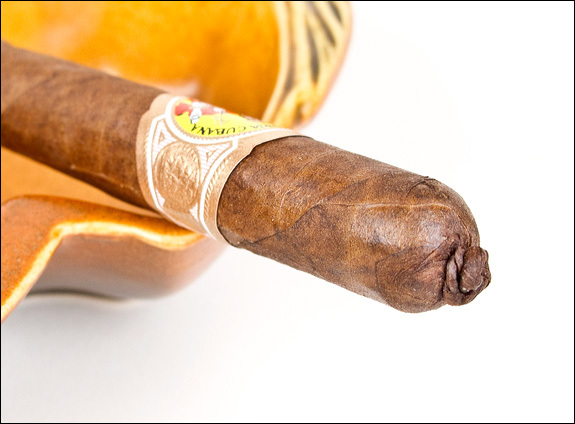 Called a lancero, or lonsdale, they all fall under the category of a panetela. Whatever you call it, these skinny cigars deliver more flavor than their fatter brethren. 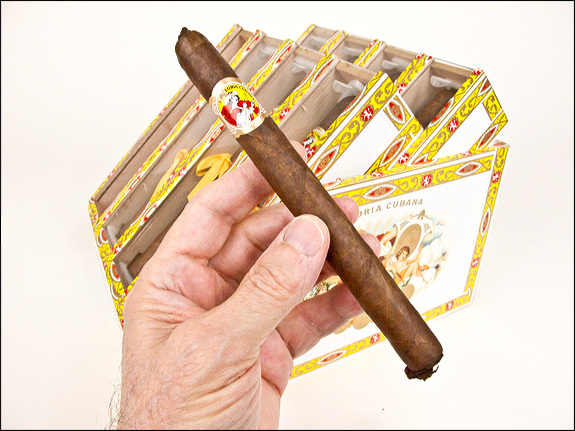 One other fine example of this is the La Gloria Cubana Rabito de Cochino. It weighs in at 6.5×46, and at first glance looks quite thin. But, in your hands, it feels more substantial then a typical lancero. And much like the La Palina, the Rabito de Cochino is a special cigar. Rabito de Cochino means pigtail in Spanish. As its name implies, each stick is finished with a tight, twisted pigtail cap. At the other end is a shaggy foot, with the wrapper uncut and folded over the end of the cigar. This style of cigar construction is as functional as it is aesthetic. The pigtail cap is rugged, keeping the wrapper tightly wound around the cap, while the shaggy foot protects the delicate open end from damage. These days it’s common to see paper rings that protect the foot. The shaggy end of the Rabito serves the same purpose. It’s pretty awful trying to smoke a cigar with a damaged foot. 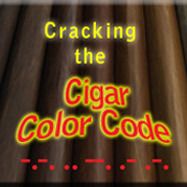 If it splits, the crack usually gets wider once the cigar is lit. This split can grow along the length of the stick, ruining an otherwise good cigar. Rabito de Cochino means pigtail. La Gloria Cubana (the non-Cuban version), was founded by Ernesto Perez-Carrillo. He built it into a well-respected brand, and sold it to General Cigar in 1999. It has since lost none of its luster, and continues to be of top-notch quality. With excellent construction, and a firm draw, this cigar delivers lots of smoke, with an even burn. It needs few touchups, and provides forty-five minutes of super cigar satisfaction. A friend introduced me to this cigar, and it was love at first light. I soon ordered a box, and was delighted when it arrived. It came in see-through, plastic-topped coffins, each containing three sticks, and bound by a bright, yellow ribbon. The coffins come arranged in a display stand that colorfully present the cigars. 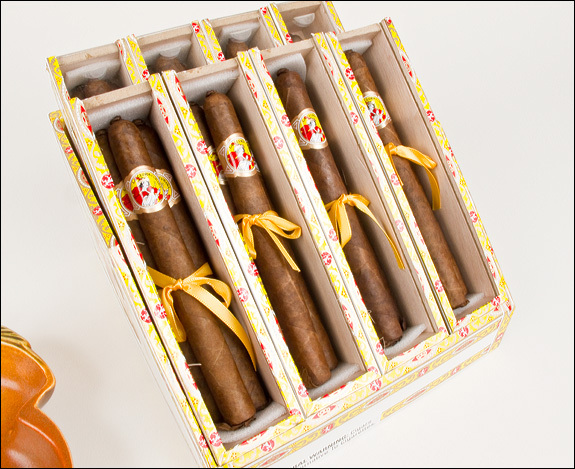 This unconventional cigar “box” further enhances the enjoyment of the Rabitos. 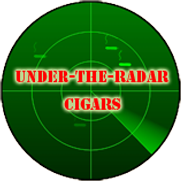 They look great in your humidor! The Rabito de Cochino is an aromatic cigar, not earthy like the La Palina Maduro Lancero. But it’s got a touch of Nicaraguan ligero, providing enough spice to keep it interesting. Much of the Rabito’s aroma comes from its Ecuadorian Sumatra wrapper. It’s got a woody character, similar to that of a Cameroon, but with a deeper flavor. It’s the perfect compliment to this complex, Nicaraguan/Dominican blend. The Rabito de Cochino display “box”. The Rabito is a refined smoke. With nuances of flowers and herbs, it pays homage to the finest Cuban cigars. Sometimes we smoke cigars to relax, while other times it’s to explore new worlds of cigar flavor and intensity. The Rabito de Cochino is the type of cigar that doesn’t challenge your senses, but rather soothes them. It’s an easy-going cigar that can be smoked any time of day, and doesn’t leave you couch-locked. But it’s got tons of flavor, and is a lot of fun to smoke. With a great presentation, and mild manners, the Rabito de Cochino has gained a permanent place in my cigar collection. It reminds me of why I smoke cigars…to relax, and appreciate how good life can be. I recommend it to all cigars smokers, regardless of experience. And the little coffin boxes makes for great cigar trading. Manufacturer: General Cigar Co., DR. Thank you for all the detailed information! Well done! No place else gave this amount of info on this cigar, and I have been in love with these since the first time I tried them. I agree with you, it’s totally a relaxing cigar and reminds us of the pleasures of why we love cigars.